Warm or cold, dreary January days can get us down. What’s to be done? Even if you don’t go outside much these days, nature can help you get through this time of year. One thing you might do is to recall the natural sights you may have seen in the past year by taking the annual Nature Notes quiz (below). Another thing to do is to review the nature sightings – descriptions and photos – that Westborough residents have shared on the WCLT Sightings page (http://www.westboroughlandtrust.org/sightings.php). Finally, do something to help the local natural environment – you’ll feel good about it. Consider joining the Westborough Community Land Trust (WCLT) during its membership drive this month. If you’ve enjoyed reading Nature Notes or walking on the Charm Bracelet trail and side trails – or would like to do so (there’s probably a trail near you!) – consider supporting land preservation in Westborough and nature education with an inexpensive membership (http://WestboroughLandTrust.org/join.php). Quiz – Who am I? To take the annual Nature Notes quiz, read the short descriptions below of plants, animals, fungi, and more from Nature Notes in 2013. See if you can match these descriptions with answers from the alphabetical list that follows. Choose your answers from the drop down lists. Check your answers by clicking the "Show Answers" button. The answer page will contain links to the 2013 “Nature Notes” columns so you can re-read them or any of nearly 200 Nature Notes columns. 1. I’m a robin-sized bird of northern forests and in winter I sometimes show up in Westborough to eat the dried crabapples on ornamental trees in parking lots. 2. Westborough is not a seaport, but you can see me here because I like the food I find in fast-food parking lots and at the dump. 3. 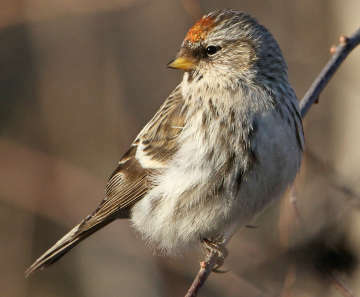 I’m an acrobatic little bird with a red patch on my forehead, and I tend to come south every other year from more northern parts and eat at local thistle feeders. 4. I’m an invasive plant with the smell and taste of garlic, and I’ve recently arrived in Westborough. 5. I’m a small brown butterfly of spring typically found near white pines. 6. Even though my showy yellow blossoms are pretty on a shoreline, remember that on this continent I’m an invasive plant. 8. 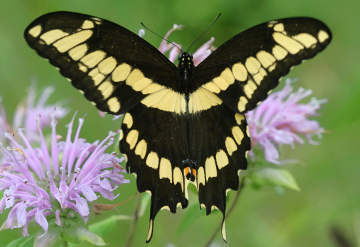 I’m a large butterfly who is new to town in past the two summers, possibly thanks to a warming climate. 9. Do I have the smiling face of a monkey? Decide for yourself if you find me – look where the soil is wet. 10. I might make you nervous when I fly nearby because I’m so large, but I’m unlikely to sting you because I’m busy hunting a summer insect that sings in the trees. 11. You might spot me on the ground as you walk a trail, as I spend most of my time on the ground hunting other insects or in the ground where I make my burrow. 12. 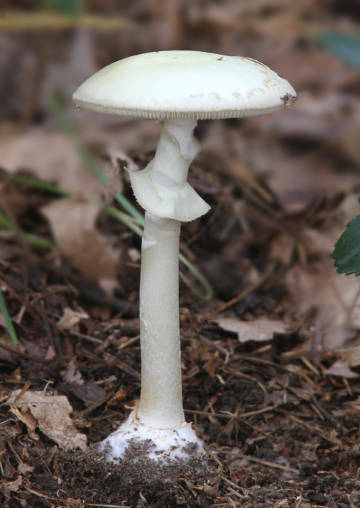 White like a ghost, I’m the most poisonous mushroom in Westborough’s woods, but I also benefit trees with helpful underground fungus-root connections that help tree roots absorb water. 13. 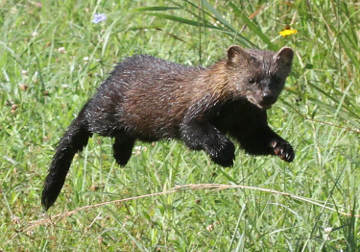 If you glimpse a mysterious animal, it might be me – I’m a weasel with teddybear-like ears and I’ve made a comeback in recent decades. 14. I’m not a plant, animal, or fungus, but you might find me on rotting wood or even wood chips.